One of the great things about being a writer is hearing from readers and fans. It never fails to make my day when I receive an email or letter from kids or parents who have read one of my books (usually it’s a Ballpark Mysteries book or Miracle Mud, but sometimes I hear from fans of my non-fiction chapter book, Babe Ruth and Baseball Curse). Here’s one of the latest letters that I received, from an eight-year-old boy here in Newton. Hopefully he found the Ballpark Mysteries at our great local bookstore, Newtonville Books. 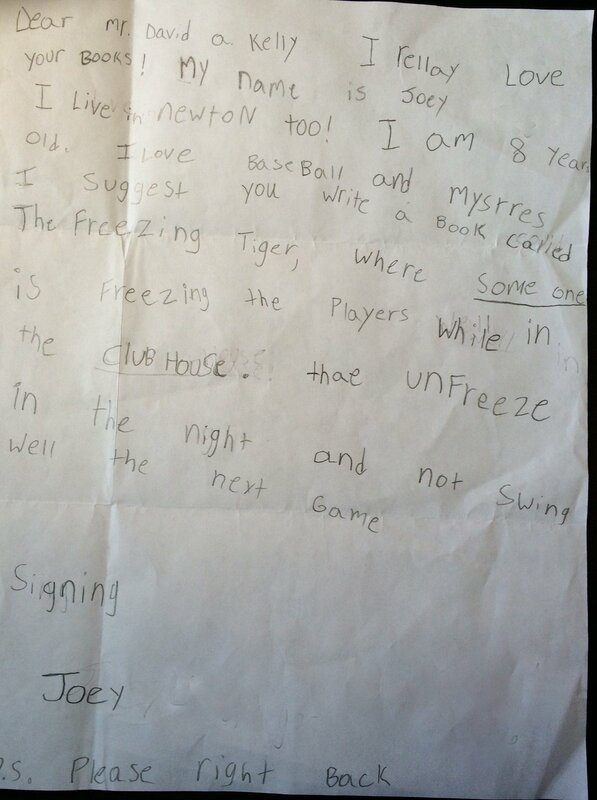 If it’s too hard to read, Joey is suggesting that I create a new mystery called “The Freezing Tiger” where someone (his emphasis) is freezing the players in the clubhouse and then they unfreeze in the night and don’t swing the bat very well in the next game. (Perhaps Joey has been watching some Red Sox games? ).